As stated in a recent post on Raconteur.net, some businesses are beginning to recognise that they need to go a step further with promoting employee health. While most companies offer some form of dental insurance along with their benefits package, that discount for dental treatment may not be enough. 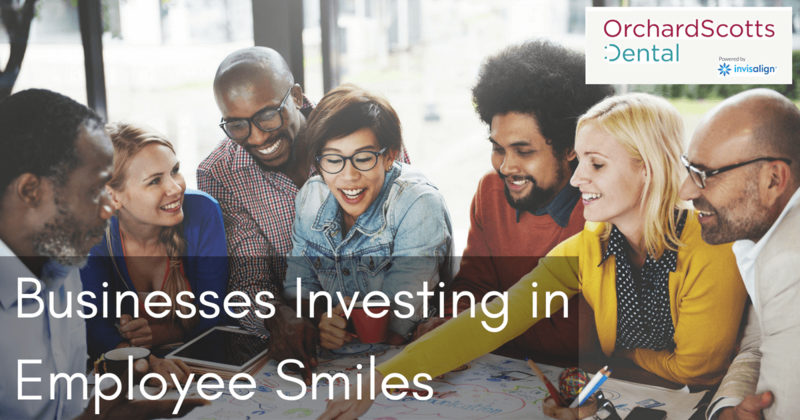 There are other things that a company can do to ensure a workforce with healthier, brighter, and better smiles. A study by Bupa claims that about 70 percent of employees think that their company doesn’t invest in any health initiatives. Others believe that their employer only talks about health, but doesn’t make any real or effective changes to their health policies. Many businesses are afraid to initiate more health programmes. They are afraid that it will cost them too much money, and that these costs will eventually cut into profits. However, there are tangible and intangible benefits that can be derived from health initiatives. When people are healthy, they tend to be happier. As employees feel good, they can perform better at work and produce more enthusiastic and creative ideas. Company profits tend to rise as a result of the increase in productivity and creativity. Customer service also improves because the employees behind the desk are more caring and pleasant towards clients. In addition, employees stay healthier and have fewer medical bills that cost the company money via insurance payments. When a company offers dental insurance, its employees are more likely to go for checkups to take better care of their teeth. That means fresher breath when greeting clients and a cleaner, brighter smile for customers and colleagues alike. Therefore, the company definitely benefits overall. Another benefit associated with dental insurance and oral health programmes is employee retention. Patrick Watt, corporate director for Bupa UK, asserts that “It’s a great way to attract, retain and motivate staff.” Especially in a city like Singapore, where competition for talent runs high, offering a comprehensive dental insurance plan is a powerful incentive for both current and potential employees. When workers feel like they are receiving significant benefits and being well cared for, they are more likely to stay loyal to the company. Some major businesses with large corporate buildings have even provided space for dental clinics on-site. These clinics cut down on the number of hours that an employee has to spend away from the office to get dental care. It also serves as a clear sign to employees that the company does indeed care about their health. Are you curious about the available cosmetic dentistry treatments? Consult with an expert at Orchard Scotts Dental, one of the best dental clinics in Singapore. We’ll be happy to show you our broad range of services, from teeth whitening and Invisalign to dental implants and porcelain veneers. If you own a company, and you’re interested in starting a programme to encourage your employees toward better oral health, discuss your ideas with the Orchard Scotts Dental team. Together, we can figure out how to improve the dental treatment and oral health of the people who work for you.